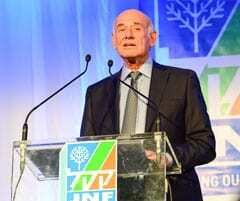 JNF gala fundraising events throughout the country were addressed by an engaging Israeli war hero joined in Sydney and Melbourne by a current serving Israeli Cabinet Minister. which Israeli tanks were outnumbered by the Syrian Army by eight to one. Kahalani, who many believe saved Israel from defeat in that infamous battle, went on to become Deputy Mayor of Tel Aviv and a Labor member member of the Knesset. He was joined in Melbourne and Sydney by Israel’s Minister of Science and Technology Ya’akov Peri well-known asa former head of Israel’s security agency Shin Bet. Kahalani’s message to the community was clear. He believed firmly in the expression from King Solomon’s Kohelet: “Generations go [pointing to himself] and generations come [pointing to schoolchildren] and the land is there forever”. 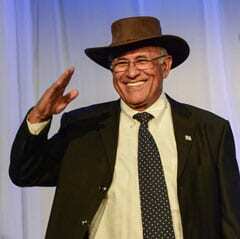 He symbolically handed over the flag from his hands to those of a member of the emerging generation. The fabled fighter, who received burns to 60% of his body when fighting in the Sinai in 1967 spending a year in hospital, demonstrated his commitment to this statement by appearing in fron of almost 800 guests at Randwick Raceourse in Sydney holding an Israeli flag. Minister Peri spoke more on topical affairs impacting on Israel…a rare opportunity for members of the Australian Jewish community to hear directly from a distinguished Cabinet Minister. Among the VIP guests attending the event were NSW Governor Marie Bashir and her husband SIr Nicholas Shehadie, Federal Minister Malcolm Turnbull and Union official Paul Howes. 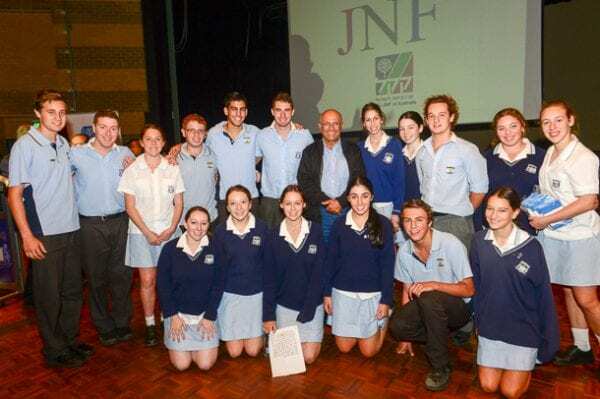 JNF Australia showed a movie of the efforts they have made in the development water facilities at Shar HaNegev, directly opposite Gaza. Kahalani visited Perth, Adelaide, Melbourne, Sydney and Brisbane.